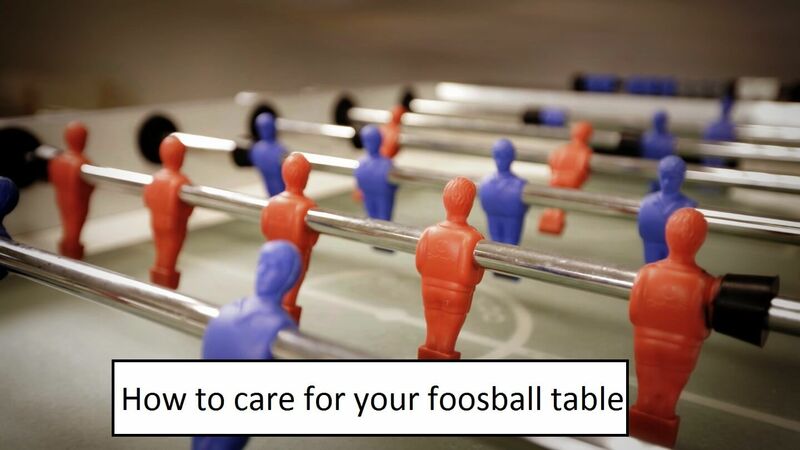 Foosball Table Maintenance - Learn How to Care It! Foosball Table maintenance is very simple. The rules governing cleaning is in relation to what you would do for cleaning your antique or very much prized piece of furniture. As you consider your furniture an investment; your foosball table is also an investment. To get many years and enjoyment from your investment, it is important you keep it well maintained. If you are looking for a new table read this! Firstly, ensure your foosball table is kept free of moisture. Spills from beer, water, drink or any liquid is a no-no for any foosball table. Dirt, dust, scuffs marks, ball marks, scratches are not good for your table as well. It is recommended to have coasters close by for drinks and to have a small table near the playing area to put all drinks on. Even though the foosball table is made with coasters, they are not protection enough for your table. During play, the liquid can be spilled by flailing hands or balls shooting out from over the edge of the table. Accidents may also be caused by too vigorous play and drinks will spill. Foosball tables that are used quite frequently need to be cleaned once per week. This will ensure all the spills, dirt and scuff marks are removed to ensure playing is comfortable. If the table is used less, then the cleaning period is a bit more relaxed as it can be cleaned once per month. Cleaning, Cleaning, Cleaning is a must! 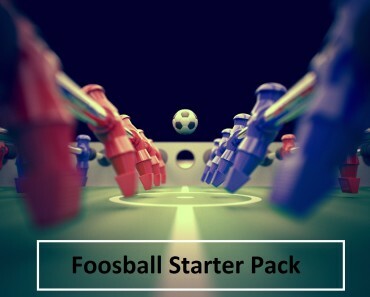 Firstly, take a clean cotton cloth to wipe all dirt and dust from the surface of your foosball table. Then using a clean cotton rag with some rubbing alcohol, which can be either 70-80% alcohol, you apply the alcohol sparingly on the cloth and wipe the surface of the foosball table. The alcohol is fast drying and will give your table surface a thorough clean, removing black mark and any residual spots from any other element that may have gotten on the surface. Cleaning the table is for sure one of the most important Foosball Table Maintenance tasks. Here is another foosball Table Maintenance task you need to know about. Your Foosball Table rods do a lot of work, so lubrication is essential to good working rods. Silicone is the approved solution for lubricating your foosball table rods. You can lubricate your rods at least once per month to ensure there is no sticking of the rods during play. When applying silicone to rods, move them back and forth to ensure the oil is evenly distributed. Please be advised; WD40 must not be used on the rods as a substitute. This will cause horrible drying of your bearings and bumpers which will need quicker replacement than planned. Having loose parts on your foosball table is a definite no-no. They must be glued down as soon as they occur to ensure the surface of your foosball table is maintained and also any other parts that may be chipped or are peeling. There are many good types of glue on the market, so choose the one you have confidence in to do this job. Remember to avoid glue spilling on the playing surface as this will be hard to remove and the surface may be damaged during your trying to remove the stuck on glue. Your foosball table is not the only thing to be cleaned. You must clean the foosballs also. These are easy to clean; you will need some mild dish detergent and a soft scouring pad. Gently wash your balls with the scouring pad and detergent to remove any black marks or dirt residue, and here is a trick to maintaining the white color of your balls for a time; put them in a pair of white tennis socks and run them through the washing machine cycle while doing your whites. This will do the trick. Your playing men can also be cleaned with rubbing alcohol to remove any scuff marks or debris; ensure you use a clean cotton cloth. Examine them for loose screws and tighten them. If you have other parts that need changing ensure that they are changed during your cleaning time or as needed, so as to have a well-maintained foosball table for playing. Protecting Your Foosball Table from the weather is extremely important. If playing foosball on the lawn, never leave the table outdoors overnight, as dew or possibly night rain will be the monster that destroyed your table. The table must be put inside in the garage or back in the games room for safe keeping. Wipe down the table with a dry cotton cloth to remove any dust or microscopic debris that may have gotten on the table while being outdoors. Cover table with a foosball table cover to protect from dust. Your foosball table is an investment; your investment needs to be properly maintained in order to ensure you have many years of play. That’s why Foosball Table Maintenance is important!